Eat Drink Paint • Kim Rempel: Van Gogh! Up Close and personal. Van Gogh! Up Close and personal. This weekend we travelled to the National Gallery in Ottawa to see Van Gogh: Up Close. What a show! Seriously, I was in heaven and could have stayed there for hours and hours walking back and forth, absorbing, staring, drinking it all in. I almost felt happy tears coming. It was *that* good. The painting that really blew me away was Large Plane Trees - a show stopper. It glowed. I couldn't peel my eyes off it. Such glorious brushstrokes of colour. And he painted the most interesting juxtapositions of colour side-by-side. What a master. Afterward in the gift shop (because everything ends in the gift shop : ) I was disappointed to see that all the reproductions of that painting - in all its many forms - were somewhat lack-lustre. The above repro is very true to the original (but of course that depends on your moniter). If you ever have the opportunity to see this painting in person, go. I promise, it sings. My next favourite was Sheaves of Wheat and conversely, most reproductions of that piece have bright, saturated, pumped-up colour. This was the most true reproduction I could find and it was glorious in its softness. 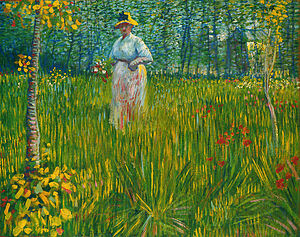 I also included Woman Walking in a Garden, which caught me by surprise. When you look at it for a while you realize how beautifully the figure was handled - the skirt blending into the grasses (look at the right side! ), the face really a few strokes of brilliant red, pink and mauve. The movement of brushstrokes in the field and forest behind, as well as the colour variations are stunning. The audio guide stated he painted roughly 900 paintings in his 10 years as an artist. 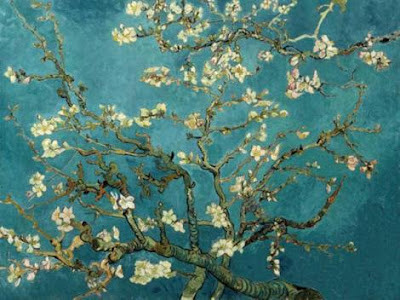 And although I could go on and on (and hey - if you've hung in this long I'm tempted) I will leave you with one last treasure: Almond Blossom, which was exquisite. Vincent painted this for his newborn nephew Vincent Willem (Theo's son). The exhibit ends September 3rd so if you can find any way at all to get there your soul will thank you. And thank you Vincent for leaving such beautiful gifts for this world. And thank you Kim, my soul thanks you. Yeesh I don't think I can get there before it closes. Aiee. I want to. Great post! It's great to hear about how art affects other artists! Sounds like a wonderful experience! Wow wow wow this is stunning stuff. So glad I read your blog, because I'm unable to attend the exhibit. Malheureusement;( Really loved the images. Fortunately, we enjoyed Picasso in Toronto. What a fantastic post. I have been wanting to sit down with a coffee and catch up on your enjoyment and appreciation of art. 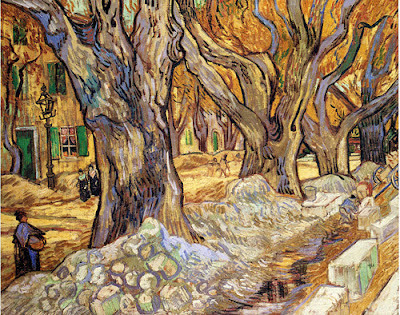 These are wonderful examples of Van Gogh's work! I can only imagine how glorious they were to see in person. I am so happy you were able see this exhibition and you gave me "happy" tears just imagining it all! Thank you! My blog is composed of generally three types of posts: my daily 6"x6" paintings (all for sale with a "buy now" button), my larger works (please contact for a price if interested!) and "ARTLOVE" (posts highlighting various artists I admire). If you'd like to see a bunch of available paintings in one window, click here! Thank you! Welcome to my visual diary: Eat Drink Paint. It's a journal of daily painting to push myself and see what can happen. I welcome any comments, questions or general musings. Feel free to drop me a line, I'd love to hear from you (email: krempel123@gmail.com). All paintings posted are original and for sale. Thanks for stopping by! Daily paintings make an original way to commemorate all sorts of special days. How about a birthday gift painted on the day the recipient was born? Or just a great way to say I'm thinking of you. Propped on a shelf, displayed on an easel or framed...all great ways to enjoy your painting!